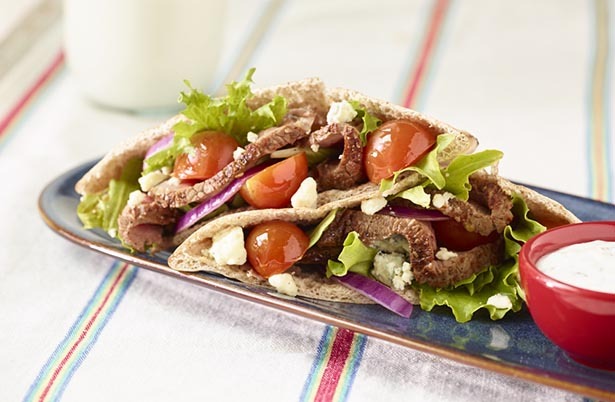 Fill pita bread halves with mixed salad greens and tender pieces of steak drizzled in yogurt dressing. Rub both sides of steak with salt and pepper. Heat a medium, non-stick skillet over medium-high heat. Cook steak about 6 minutes on each side (for medium) or until desired. Allow steak to rest 5 minutes before cutting into thin slices. Warm pita halves in toaster. Into each pita half, spoon 1/4 of the yogurt dressing, mixed salad greens, blue cheese, onion, steak and tomato. Spoon additional yogurt dressing over top.